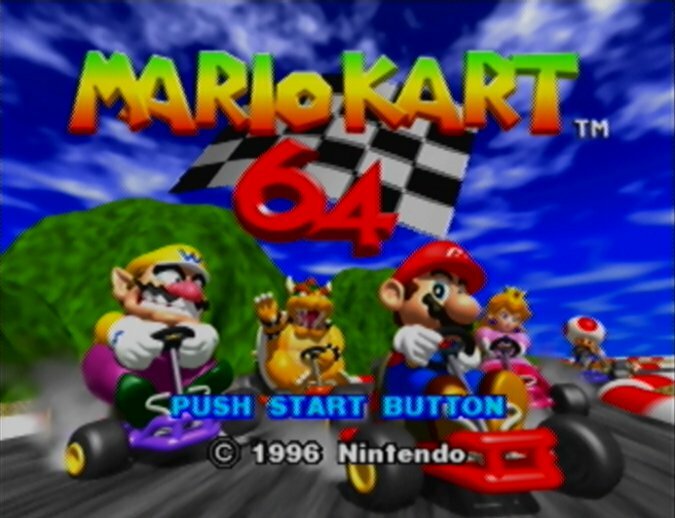 Mario Kart 64 was one of the N64’s most popular games during its prime, and the second bestselling game on the system. Its split-screen multiplayer mode was a huge draw at the time, but is it still worth returning to today? What’s immediately apparent when booting up Mario Kart 64 is just how light it is in terms of content. It features only 16 tracks and eight playable characters – all of which are immediately available. You also can’t customise your vehicle as is the case with more recent entries in the series. The characters fall into three different weight categories, which affects their top speed, handling and acceleration. 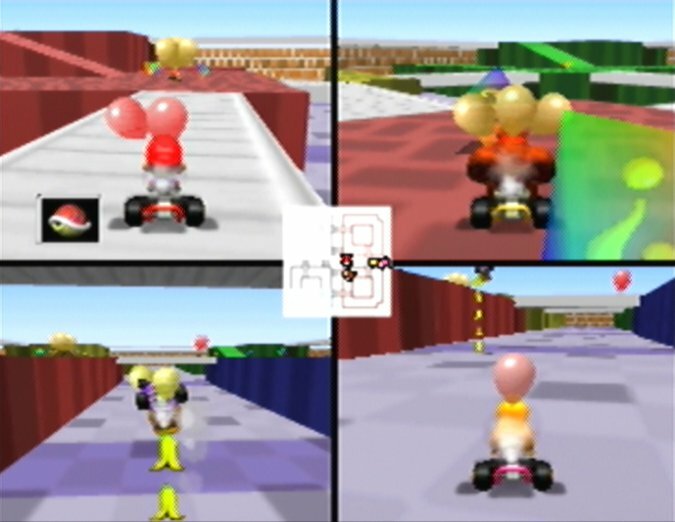 Having instant access to everything for multiplayer is ideal, because Mario Kart 64’s single-player Grand Prix mode is a dull and repetitive slog (thankfully a second player can endure it with you). Otherwise, the main attractions here are the Versus and Battle modes, which still provide an abundance of hilarious, chaotic fun. Grand Prix consists of four cups to complete at three different engine classes: 50cc, 100cc and 150cc. The higher the engine class, the more difficult it is to control your kart – the AI puts up more of a challenge too. Playing through Grand Prix at each class is essentially identical: there isn’t any variety in the gameplay, nor is there anything for you to unlock, except for an alternate title screen and mirror mode – the latter of which is hardly enticing after having essentially completed the game three times already. In each cup, your goal is to earn as many points as possible across all races to achieve a podium finish at the end. Only by finishing a race in one of the top four positions (out of eight) can you earn points. It’s a good setup because it means you can get away with making the odd mistake or getting taken out by an opponent. 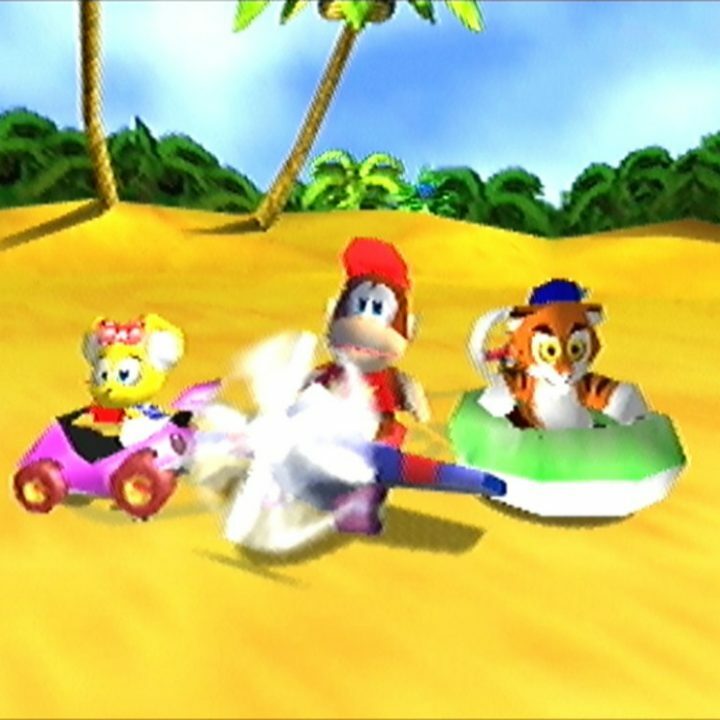 You can perform poorly in a race, and it doesn’t necessarily mean you’ve lost the cup (It’s certainly a lot more merciful than Diddy Kong Racing). You may be able make up for it in later races, especially if you target the opponents who pose the greatest risk to your leaderboard position. It’s just as well, because Mario Kart 64’s chaotic item system can cause upsets right up until the last few seconds of a race. This creative selection of projectiles, hazards and special items is the game’s defining feature, and it can help you just as much as it hinders you. The item you get when driving through a question-mark box is influenced by your position at that point in the race. Trail behind and you’ll have access to more potent power-ups such the player-shrinking lightning bolt or the infamous blue shell that hunts down the racer in first place (taking out anyone else in its path along the way). 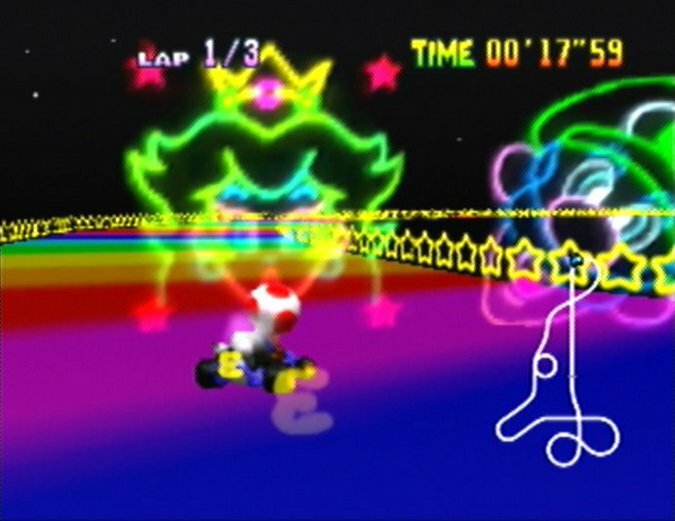 If you’re at the front, you’ll receive banana peels or single green shells to use against racers encroaching on your position. The item system has a surprising amount of depth to it, and mastering its intricacies will go a long way towards securing the lead. Many items, for example, can be held at the back of your kart, acting as a makeshift shield against incoming projectiles. 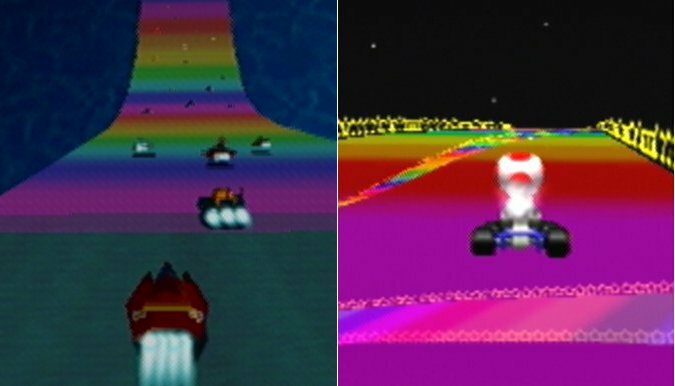 Adopting a tactical approach to using items is especially ideal considering Mario Kart 64 features heavily rubber-banded AI. While it means you do always have a chance of climbing back up the ranks should you fall behind, it also means opposing racers are almost always right on your tail if you’re leading. On the higher difficulty modes, it’s especially noticeable; take a racer out with an item and they’ll have caught up with you again in virtually no time at all. It cheapens the experience somewhat, forcing you in many instances to save using an item on an opponent until the last stretch of the final lap. It also seems to make the character categories somewhat redundant, as you can never actually outpace AI players with a top-speed character. Trying to deprive specific AI racers of points can be difficult too, as the race positions are locked into place the moment the player(s) crosses the line. 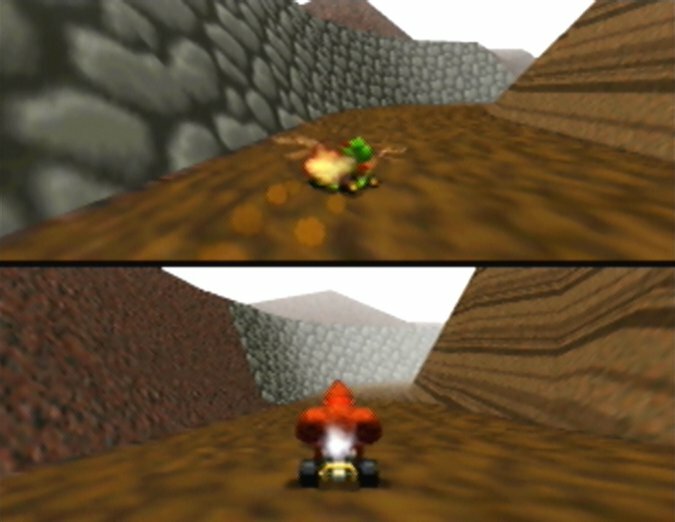 You need more than just items to win gold at the higher difficulty levels: learning the tracks and adopting Mario Kart 64’s very limited number of advanced techniques is key too. Powersliding enables you to get round tighter corners while also potentially providing a mini-speed boost if you waggle the stick left and right. The karts feel slippery to control and have large turning radiuses, not that it seems to matter much as clipping walls and scenery does little to impact your speed. 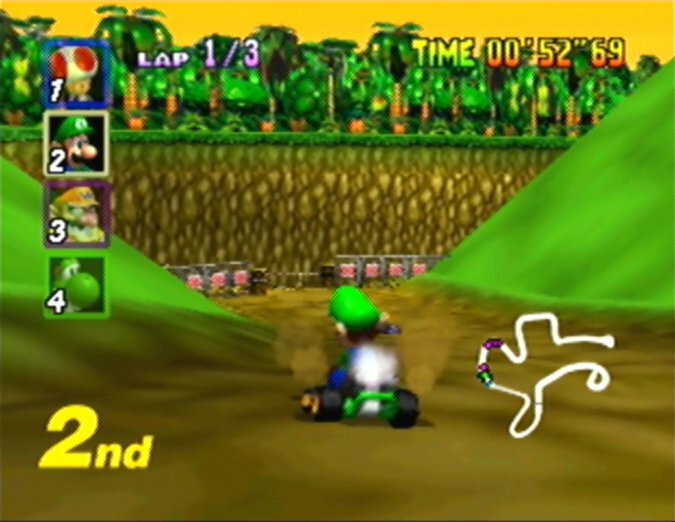 Mario Kart 64’s vibrant and colourful tracks are fun for the most part, drawing plenty of inspiration from both the Super Mario universe and the real world. Some tracks have aged better than others in terms of entertainment value, mainly the ones that incorporate a wealth of hazards and features. Nevertheless, 3D is used to good effect to create tracks that rise up and down, and feature a good amount of bumps and jumps. The game’s battle mode holds fond memories for many people, and with good reason. Up to four players can face off in one of four arenas, using items to win a battle royale scenario where the last racer with at least one intact balloon on their kart wins. A couple of the maps simply aren’t worth playing, but Block Fort and Double Decker both make great use of height and tight spaces, resulting in treacherous, often shell-laden gauntlets. 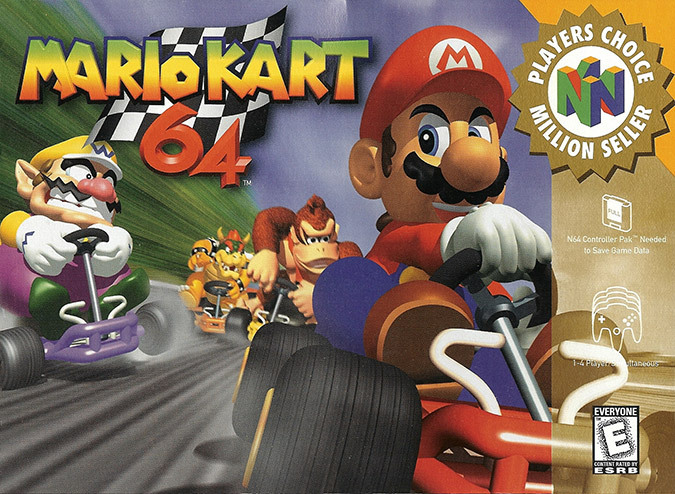 It’s immensely fun and addictive with four players, and arguably the biggest reason for wanting to play Mario Kart 64 today. Moreover, Mario Kart 64 runs reasonably well in terms of technical performance, pretty much maintaining a smooth and consistent frame rate with just one or two players. 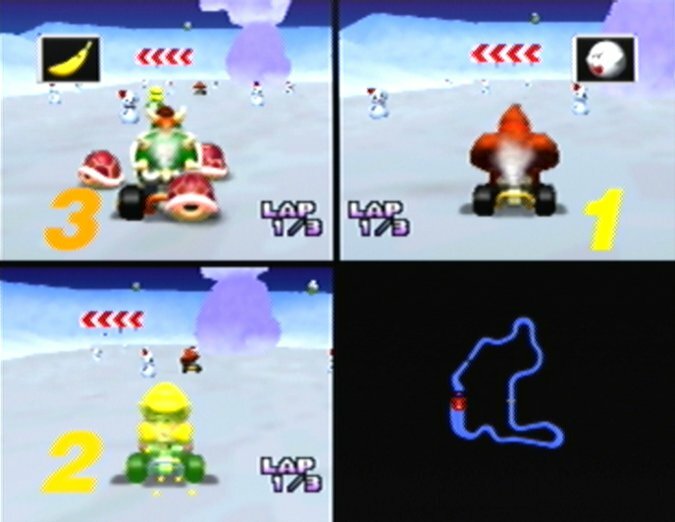 When played with three players or more, it’s noticeable that the game struggles on certain tracks, and as a result the game speed is altered to make up for this. It’s far from an ideal solution, but unless you’re super picky about frames it shouldn’t be enough of an issue to stop you from playing. 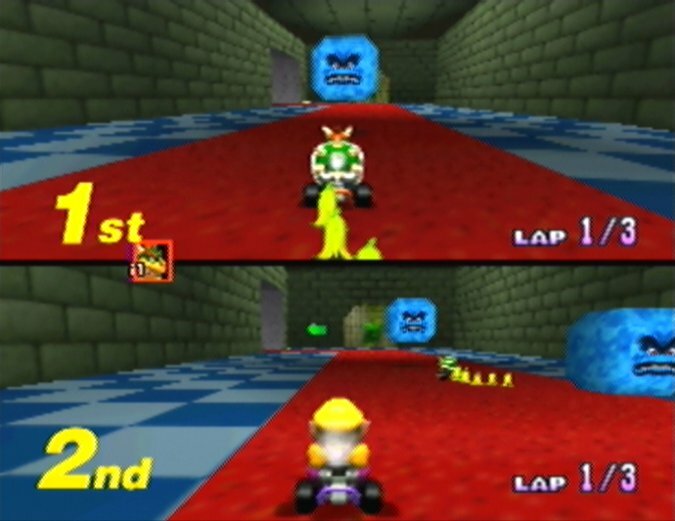 It has to be said that the game does rely on 2D sprites for its characters – a shame given other kart-racing games proved 3D character models were certainly viable on the system. 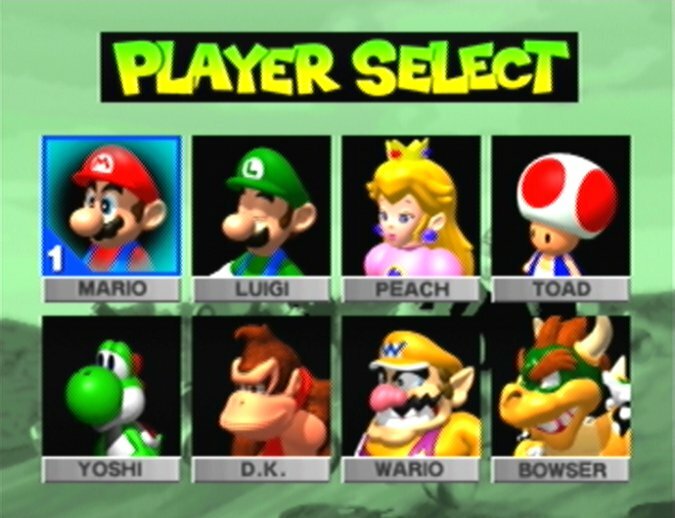 Overall, Mario Kart 64 is a mixed experience, and whether you enjoy it will ultimately depend on how much you like multiplayer games. The Versus and Battle modes are still great fun, often proving to be chaotic and downright hilarious, thanks in no small part to the game’s surprisingly tactical item system. 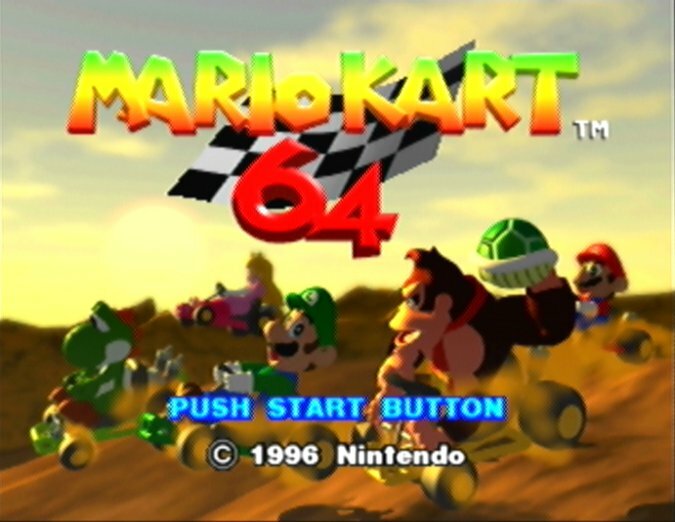 From a technical standpoint, Mario Kart 64 holds up in multiplayer, although it’s far from perfect, and gaming enthusiasts will no doubt notice the downgrade from single player. 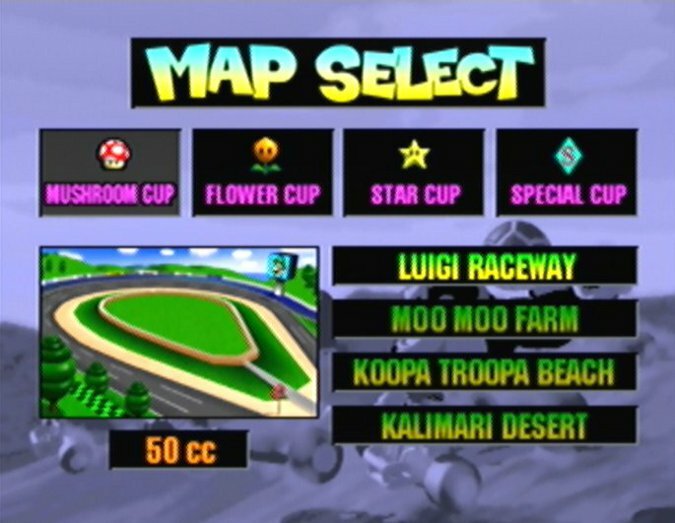 Otherwise, Mario Kart 64 is incredibly light on content, with very little to unlock. This wouldn’t be so much of an issue if the game’s Grand Prix mode were more engaging. Unfortunately, it’s a dismal and horrendously repetitive affair that can quickly become frustrating, as a result of cheap, rubber-banded AI and the randomness that items introduce. It all feels very uninspired, which is surprising given Mario Kart 64 arrived at time when Nintendo was pushing boundaries with games such as Super Mario 64.